On 16 June 1944, arrests were numerous throughout the Department of the Somme, and partisans were interrogated, tortured, interned and shot. 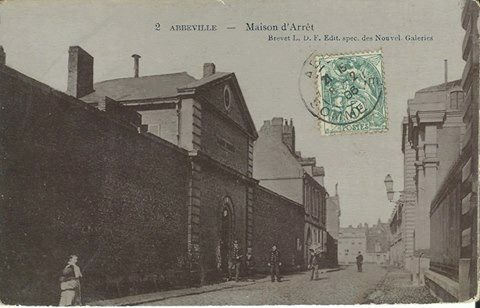 The 3rd Company of Franc-Tireurs and Partisans of the Vimeu, that of the Marquenterre and the 6th Company of Abbeville count many members among the 70 resistanceists, prisoners of the Abbeville Prison. Some of them are condemned to death and will be shot shortly. The situation is dramatic. - Some men, for the sake of "Fraternity", do not hesitate to put their lives in danger once more, to save that of their comrades of the Resistance. - Their hierarchy judged the operation too risky, but Lieutenant Julien FUZELIER, Second Lieutenant Robert RICHARD, Second Lieutenant Robert BERTAGNE, Lieutenant Alphonse NOYON, Chief Warrant Officer Serge LECUL, Chief Warrant Officer Charles SELLIER, Warrant Officer Daniel LECUL, Warrant Officer Jean HEUX, Sergeant-Chef Aimé HOLLEVILLE, Sergeant Alfred BENOIT, Sergeant Armel AROUED, on 22 June 1944, attack Abbeville prison to free their comrades. On the night of 21-22 June 1944, the men of the commando won Abbeville, each man was heavily armed with a machine gun, a revolver and grenades. At five o'clock the men were in position in the ruins of a house in the Rue Dumont, and then approached the entrance of the prison furtively, from ruin to ruin. Robert BERTAGNE, of the General Staff of Amiens, joined the group at this time, he came especially to join the attack. Julien FUZELIER appreciates this reinforcement of quality. Three groups are formed to make the assault, the wait has been long, the fatigue felt so far disappears, the wait is endless until 07:45, when the guard DEILLY arrives at the corner of the street and presents himself At the door for the succession, it is a sign for the first group that takes advantage of the opening of the door to invest the premises. Not a shot. The other groups ensure the security of the surroundings and are ready to defend the position. Inside, the four men crowd on each side of the corridor, the guard rang and understood, framed by the armed men, he does not intervene, his colleague inside recognizes it and opens the Heavy doors. The men leap into the great hall, a door opens, the chief warder alerted by the noise is immediately neutralized. Asked, he informs that there is no guard post, but only a German soldier, who in turn arrives, and who is apprehended immediately, with the wife of the chief guard. Only three minutes have elapsed. The door of the prison is closed, the grid of access to the cells is opened, the telephone is put out of use. The men's quarter is visited, all the cells are open to find the comrades. The first cell serves to enclose the German soldier and the two guards. The commando finds his comrades, including Mr. Charles GAILLARD, who immediately helps to visit the cells. The two floors are thus emptied, then comes the turn of the women's district, where the emotion is great, the noise having distracted them. They think men are taken to be shot. The mass of the 161 prisoners released creates a certain confusion in the corridors, and the regrouping of the resistance is difficult. Robert RICHARD brandished his revolver and called for calm, he told them "No panic, you are free thanks to the Resistance! You will come out in small groups, normally not to attract attention. The resisting comrades embrace and evacuate the premises, the doors will be closed, and the alert will be given only at 9 o'clock. The men of the commando are won with immense joy, which seemed impossible yet yesterday was realized. Resistants disappear furtively in the small day. The men who remained in the street on the cover had detained civilians and police officers, who would prefer to refrain from making themselves known in order to avoid any retaliation by the German authorities. The coming and going of the men of "common law" will attract attention and they will be picked up quickly and put back in prison. The "Feldgendarmerie" and the "Gestapo" rush to the scene and conduct interrogations, which will be unsuccessful. The guard will not speak, will be arrested eight days later and will lose his job, which he will find at liberation. He had replaced a comrade to-day, but he was mistakenly suspected, but was deported to Neuengamme, where he died on 11 January 1945, the only victim of this mission. He had replaced a comrade to-day, but he was mistakenly suspected, but was deported to Neuengamme, where he died on 11 January 1945, the only victim of this mission. The dismantled company survived thanks to these 11 shadow men who dared. She returned to hiding and was preparing for the liberation struggles at the imminent arrival of the Allies. Gamaches will be released on September 2, Abbeville the 3rd.